Simon Sousa, shell shocked and bleary eyed, stood on a grassy corner near the Kennedy compound in Hyannis Port. He clutched a 8″x10″ framed and signed photo of himself with Senator Ted Kennedy, a memento from when Kennedy had helped his Brazilian house cleaner get a green card two years ago. He planted a few tiny American flags and he says he may drive to Boston for the funeral on Saturday. “I do not understand, he seemed okay yesterday morning,” says Sousa, 40, who has cleaned Kennedy’s home here every two weeks for the last six years. “I was so surprised to hear he passed. Just yesterday I heard him walking and talking on the second floor” of the vacation home the Kennedy family has owned since then 1920’s. This is where Kennedy had spent much of his time after being diagnosed with a malignant brain tumor 15 months ago. He died surrounded by his wife and children and other family members who bid him loving and tearful goodbyes, according to Rev. Patrick Tarrant, who was with the family at the time. Since his death, relatives have taken turns sitting vigil by his body as the Kennedy clan  all 23 nieces and nephews, his wife Victoria of 17 years and his three children  gathered for his wake and funeral. It is the second time in two weeks the clan has descended on Hyannis Port; earlier this month Kennedy’s sister Eunice Kennedy Shriver was laid to rest here. All day long vans crammed with flower arrangements streamed past the TV cameras that spanned two blocks, even though the family specifically asked that in lieu of flowers well wishers donate money to the Edward M. Kennedy Institute for the United States Senate. The facility houses an extensive collection of Kennedy’s papers  almost all handwritten  and is dedicated to educating senators, staff and the general public about the role and importance of the Senate, where Kennedy served 46 years. In the final days, Kennedy was often seen on his porch talking on the phone, sometimes passionately, or even sailing with friends and colleagues on his 50-foot, blue-hulled schooner, the Mya. The day of his death was a perfect day for sailing, sunny and blustery with a few white caps on the bay the compound overlooks. 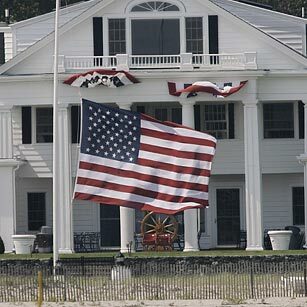 Flags around the tiny Cape Cod town were at half-mast. On Thursday Kennedy’s body will be taken by motorcade to a maple-paneled room at his brother’s presidential library in Dorchester for a wake. The body will be open to public viewing Thursday and Friday at the John F. Kennedy Library’s Smith Center, which has a stunning view of Boston’s skyline. Friday night the family will hold a private celebration of the man the family, in a statement, called “the irreplaceable center of our family and joyous light in our lives.” Vice President Joe Biden, among others, is expected to speak. On Saturday another motorcade will bear Kennedy across Boston to the Basilica of Our Lady of Perpetual Help in the Mission Hill section of Boston. It was in this church, commonly known as Mission Church, that Kennedy prayed daily for his daughter Kara when she was undergoing treatment for lung cancer. Here, Kennedy’s funeral will be held for an invitation-only crowd of 1,450. President Barack Obama is expected to interrupt his Martha’s Vineyard vacation to speak. Kennedy’s body will then be flown to Washington, D.C., where, in a private ceremony, he will be laid to rest in Arlington National Cemetery, next to his brothers President John F. Kennedy and Senator Robert F. Kennedy.